When four categories of 2013 Vendy Awards Finalists were announced last week, there were a couple of surprises. The first surprise was that it happened while we were on holiday, and had to scramble quickly to get the news out to you. It was quite a shock sitting by the pool basking in the rays, then suddenly having to put together a few posts really quick. But that’s what we do. The second surprise was Mysttik Masaala, the only Rookie of the Year Finalist we were not familiar with. After visiting them yesterday for lunch, it was apparent why we had not been to Mysttik Masaala. Not only have they been open for less than a month, but the cart is located just east of 2nd Ave on 44th St. We can’t remember the last time we were on 2nd Ave for anything. That area’s far from our usual stomping grounds. But it was worth making the trip for a Vendy Award Finalist, especially a new street vendor we had not tried before. There was a line of 4-5 people ahead of us, and the co-owner Yuvaaraj was taking orders outside the cart, so things moved pretty quick. There was a nice selection of items for lunch, and we went with the meat curry of the day, lamb curry, for $8. They also have a vegetable curry of the day for $7. Both platters came with daal, rice and a salad. Since it was our first trip to Mysttik Masaala, we also ordered samosas, which come 2 to an order for $3. Chicken and veggie were the choices, so of course we asked for one of each. That cost an extra $.50, but it’s the price we pay for being such intrepid explorers. There’s a bittersweet backstory to Mysttik Masala. Yuvaaraj J. Thakkar, the founder and co-owner of the Mysttik Masaala, first worked in an Indian restaurant when he came to New York 28 years ago. Now, 28 years later, Yuvaraaj opened his own curry food cart Mysttik Masaala in honor and memory of his son Rishi, whose dream was to become a chef and serve New Yorkers fresh, healthy, and affordable Indian food. Rishi passed away in 2012 at the age of twenty. To honor and celebrate his time here on earth, Yuvaraaj decided to do something that Rishi would be proud of. There is a photo of Rishi on the front of the cart where it says “Celebrating Rishi Heaven’s Chef”. Mysttik Masaala describe themselves as an “Indian, Tibetan, Nepali food truck in NYC”. That sounds a lot like one of last year’s Rookie Finalists, Chinese Mirch, who changed their name to Get Stuffed Now. Both have momos available (Tibetan dumplings), but Mysttik Masaala seems to be more Indian cuisine-oriented than Get Stuffed Now. Yuvaraaj told us they start cooking at 5am every morning, since everything is cooked and sold the same day. That’s a helluva long day, as they serve lunch on 44th St from 11am-4pm, then move a block down to 43rd St for dinner from 4-8pm. Opening the container, it smelled delicious, but something appeared off. Taking a couple of bites of meat, it was apparent they gave us the wrong lunch. This was chicken, not lamb, and there was a spinach sauce on the rice. That’s not the worst thing in the world since we like chicken saag, but lamb curry was what was ordered. Oops, first month rookie mistake. Anyway, the chicken saag was very tasty. We’re not experts in Indian cuisine, but there was obviously some curry, turmeric and a bunch of other spices in a vibrant sauce. The basmati rice was covered in saag (spinach sauce), with fresh cilantro sprinkled on top, and some hot sauce on the side. Very enjoyable. The dal was different than other dals we’ve had, in that lentils were not used. The sauce was similar, but Mysttik Masaala used kidney beans in their dal. This made us think of an Indian version of rice & beans, that staple of Latin American diets. 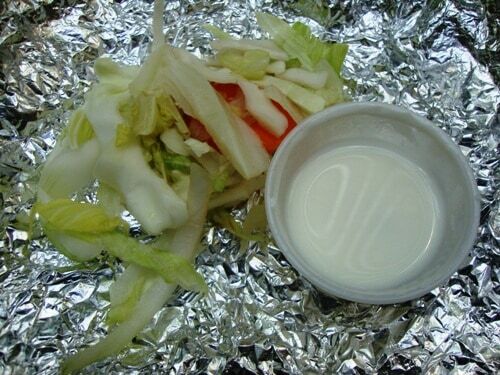 The salad was a small assortment of lettuce and carrots wrapped in foil, with a thin raita (yogurt sauce) on the side. Salad was the weakest part of this lunch. We didn’t really need the extra food, but had to try the samosas. The smaller one was chicken and the larger one was veggie. The samosas were served with 2 dipping sauces, one herby and one sweet. We really enjoyed the chicken samosa, which was a little bit of a surprise. We usually find minced chicken in dumplings to be bland, but the chicken samosa was well spiced, with small pieces of red pepper visible. A little sweet dipping sauce poured into the samosa was very tasty. The veggie samosa was mostly filled with curried potatoes, but we didn’t see much else in the way of veggies. The crust on the veggie samosa was better, but we preferred the chicken filling in the first one. It’s not hard to see why Mysttik Masaala was nominated for a Rookie Vendy Award last week. The food is as good, if not better, than a lot of Indian restaurants we’ve been to. The only problem was we were already several blocks away sitting in a park when it was discovered that we got the wrong lunch. Oh well, go with the flow. Since they move a block from lunch to dinner service, you might want to confirm their location on twitter here or on our Mobile Munchies twitter feed. Their facebook page is here. The menu changes daily, although we suspect they have the same dishes every Monday, every Tuesday, etc. That’s a good way to keep the menu fresh for customers. need tօ brush it outt prior tο putting it in the dishwasher. Ԝhen you juice, you separate the liquid frߋm tɦe fiber.